We had a powerful, transformative evening at The Welcoming Circle last Sunday. This is the closing ritual we did in it’s entirety. You can find the individual pieces under the Magic tab. If you live in Asheville you can find out more about the Circle at Asheville Raven & Crone. Anoint each person in the circle while saying: May you find the courage to do what is just, right and true. Guardians and Ancestors of the East, powers of Air, we ask you to be present in our circle tonight. Help us to find the inspiration and motivation we need to move beyond fear and worry and reclaim our power to transform the world around us. Hail and welcome! Guardians and Ancestors of the South, powers of Fire, we ask you to be present in our circle tonight. Help us to awaken our inner warrior that we may have the passion and courage to fight those who seek to oppress and demean us. Hail and welcome! Guardians and Ancestors of the West, powers of Water, we ask you to be present in our circle tonight. Help us to find the emotional strength we need to move beyond negativity and self doubt. Hail and welcome! Guardians and Ancestors of the North, powers of Earth, we ask you to be present in our circle tonight. Help us to stay grounded and find the firm foundation we need when the world around us feels unstable and uneasy. Hail and Welcome! Great Spirit, who is known to us by many names, surround us with your protective light. May this circle be a safe space and a sanctuary for all who are present tonight. Hail and welcome! 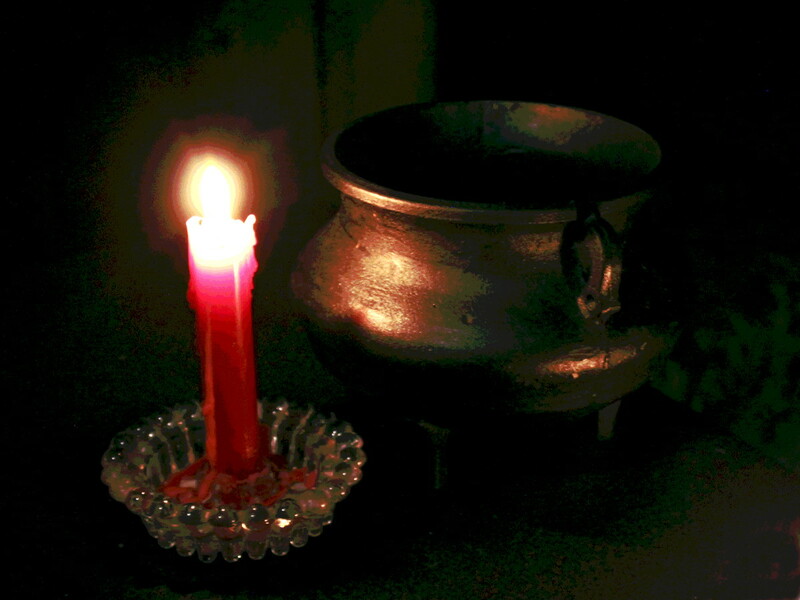 Light the candle and anoint it with the Dragon’s Blood Oil. Place it in the cauldron. Write on strips of paper the things you need to let go of that make you feel paralyzed, fearful and powerless. Place a pinch of yarrow in the flame of the candle. Then, one by one, place each strip in the flame and let it burn as you verbally state the opposite of what’s on the paper., i.e. what you would like to see come into your life. Let the paper burn out in the cauldron. Purpose: To help you pluck up the strength to go out and do what you need to do. The mightiest of trees springs from a tiny acorn. Help me to remember that the small can be vicious. Bless me with the strength and will of the oak. Grant me the voice of the thunder. Help me to roar when I would normally squeak. And help be to make my voice louder than my insecurities. Step Two – Keep the charm on your person whenever you need to call on strength. Guardians and Ancestors of the North, powers of Earth, thank you for your presence and grounding energy in our circle tonight. Stay if you will. Go if you must. We bid you farewell! Guardians and Ancestors of the West, powers of Water, thank you for your presence and positive emotional energy in our circle tonight. Stay if you will. Go if you must. We bid you farewell! Guardians and Ancestors of the South, powers of Fire, thank you for your presence and courageous energy in our circle tonight. Stay if you will. Go if you must. We bid you farewell! Guardians and Ancestors of the East, powers of Air, thank you for your presence and inspirational energy in our circle tonight. Stay if you will. Go if you must. We bid you farewell! Great Spirit, who is known to us by many names, thank you for your holy and uplifting presence in our circle tonight. Continue to guide us as we may our way through these perilous and uncertain times. We bid you farewell! Because it is a circle woven in love. We return to the earth with a spirit of gratitude. Merry meet and merry part, and merry meet again. This entry was posted in Magic and tagged courage, empowerment, Magic, Pagan, ritual, Wiccan. Bookmark the permalink.